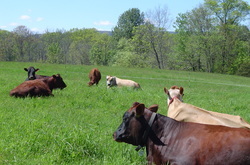 Our beef comes from animals raised in our dairy herd (retired cows, retired bulls, and steers). 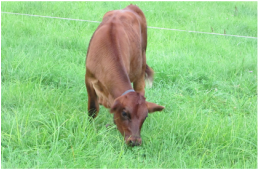 All cattle are grass fed and some are supplemented with a small amount of non-GMO grain that is grown without pesticides, herbicides, or synthetic fertilizers. 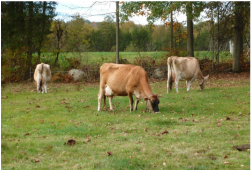 Cows get grain when lactating, bulls only as calves, and steers not at all. Beef is sold by the cut at our farm store (see price list below). You can also access our beef through our meat subscription. Items listed in orange are currently sold out. Want a bunch? We sell bulk ground beef at a discounted price. The price is $7.40/lb and the minimum quantity is 50 lbs. It is packaged into 1 lb packages. Email or call us to order and we will arrange a time with you to pick up.